It has been over two months since Robyn Gardner vanished without a trace in Aruba and now the authorities on the island have amped up the search by bringing in sniffer dogs. Robyn's longtime boyfriend, Richard Forester, has said from the early days in the investigation that he wished they would bring in Dutch dogs to help with the search. "I am glad that they brought dogs in and I'm happy about it, I just wish that they had done it sooner," he told RadarOnline.com in an exclusive interview. Doesn't this look like the Divi tree found in Aruba? ORANJESTAD, Aruba – A team of cadaver dogs has arrived in Aruba to search for the remains of a Maryland woman who was reported missing two months ago by her travel companion. Solicitor General Taco Stein tells The Associated Press that the dogs arrived from the Netherlands last weekend and will begin searching soon for the body of 35-year-old Robyn Gardner. He says the search will focus on a southeastern section of the island known as Seroe Colorado. 1 1/2 months later after declining FBI assistance ... Aruba brings their dogs to the the location of the alleged drown. Crazy!! He (Solicitor General Taco Stein) does confirm one person from the FBI, who is normally stationed in Barbados, is on the island. According to the OM, he coordinates the legal aid requests from Aruba to the United States. Stein does not expect more FIB-officers will come to the island. He states there are sufficient ‘extremely capable people’ in the Kingdom who can assist with the investigation. For example, he names a team with tracking dogs from the KLPD (Corps National Police Services) in The Netherlands that is ‘worldwide renown’ and on request could be deployed in tracing the body. ITA..SOMETHING ABOUT fORRESTER IS JUST OFF! He claims to be devastated..but has really done nothig other then give interviews. Did you see the Dr. Drew interview with him early in the case? IMO Dr. Drew knew this was an abusive relationship...he didn't want to scare Richard off...but he knew. And "poor" Richard is just so devastated that he blames everything on Robyn...the woman he supposedly loves that's missing! You'd really need to see it to watch Dr. Drew...but here's part of the transcript. PINSKY: OK. Now, Richard, I want to go to you. I want to ask you something. But please know this is not meant as an accusation of anything. These are just something that came across. FORESTER: Real quick, Dr. Drew, on that message, it did not say, "When we return." It said, "When I return." PINSKY: OK. That seems a little -- the "we" seemed out of place for me there, too. So good. I`m glad that`s the case. Two sources. I want you to bear with me on this. But two sources told us that they witnessed a loud public screaming match between you and Robyn this July. We tried to verify that. We contacted police, and they said that they -- police apparently did have contact with you that night, but no one was arrested. Let me be super clear. We are not -- we are only talking about this, because it`s been my experience that people who have volatility in their relationships may not always use best judgment. PINSKY: That perhaps would explain why Robyn was impulsive and left the country. And you know, didn`t really -- with someone she didn`t know very well. FORESTER: Well -- first of all -- I`ll tell you about that day. That was actually back in February. We`d been out. She`d had a bit too much to drink. She was angry. She started screaming. Neighbors that live in apartments, you know, very close by heard. They called the police. Police came, saw that nothing was wrong, said, "Great, sorry to bother you. Have a good night." PINSKY: I mean, I`m going to -- Richard, I`m going to tell you again this is by the facts as I understand them. The report that we heard was in July. The police report. Does that sound familiar? Does that ring any bells for you? FORESTER: No, that does not. You know what? I`m so sorry. I`m so sorry. I`m so sorry. Because it did happen twice. It happened once in my apartment and once when we were at the beach. Again, a little bit too much to drink. She was screaming. An ex-boyfriend of hers had texted me. I asked her about it. She got mad. She started screaming. They called the police. Police came, saw that there was nothing wrong, nobody was hurt and nobody was getting hurt or was about to get hurt. They left. PINSKY: Richard, did you ever worry about her alcohol relationship? FORESTER: I did. I did. I did. Definitely. It was a point of contention. I agree and have since she was reported missing. I know without a doubt that he had contradicting statements in the beginning of all of this...but, now that is gone. Does anyone else remember that? He said something along the lines of thinking she had gone to Aruba with a girlfriend...then a gay friend...then the family. Or something like that...I have been suspicious of him. AND, I'm wondering if the "ex" in this post is the same "ex" Richard referred to in his talk with Dr. Drew? Why would an ex of Robyn's be texting Richard? Maybe he knew he'd been mistreating her? Considering that Richard's timeline on their relationship (before he changed it some from what...2 years to exclusive for 8 months?) would have crossed over with the ex that's communicating with Carla Baron. The “ex” and I have kept in contact often these past few weeks. We decided to wait on the “psychic” assist for now as he is working in harmony with Robyn Gardner’s family, and their utmost wishes in regards to the search/ investigation. [quote author=texasmom link=topic=12000.msg1474039#msg1474039 ITA..SOMETHING ABOUT fORRESTER IS JUST OFF! He claims to be devastated..but has really done nothig other then give interviews. Robyn is a beautiful woman. Why was she attracted to men who verbally and physically abuse? Forrester is getting his 15 minutes of fame and probably big bucks for interviews. He claims to love Robyn but ... love would have dictated he would have been on the first plane to Aruba after learning of her disappearance. Giordano attempts to cash in on a life insurance policy three days following Robyn's disappearance. 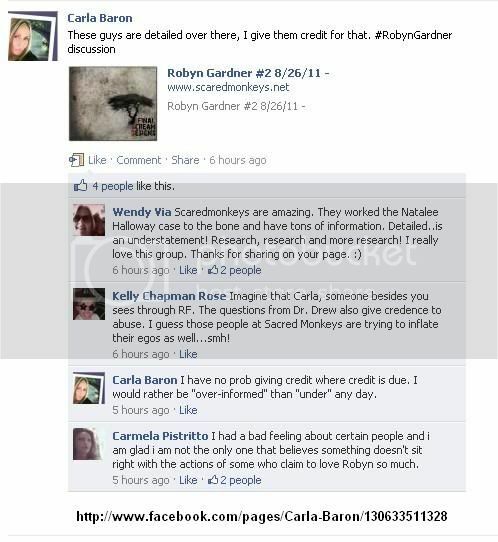 Robyn deserved so much more in terms of respect from the men she allowed into her life but failed to realize it. I haven't seen one posting about the cadaver dogs on any of the Aruban news sites yet. Looks like they may be planning to use some dogs from the US too. A team of cadaver dogs searched through cactus and scrub brush Tuesday for the remains of a Maryland woman who was reported missing by her travel companion during a trip to Aruba. The dogs and their handlers, from a private foundation in the Netherlands that regularly assists police, worked for several hours before ending their efforts for the day without any apparent success. Solicitor General Taco Stein said they would be in the Dutch Caribbean island through the end of the week. They planned to focus their search in a southeastern section of the island known as Seroe Colorado, not far from where 35-year-old Robyn Gardner of Frederick, Maryland, was reported missing on Aug. 2 by Gary Giordano, her travel companion. (CNN) -- Aruban authorities used search dogs Wednesday to comb the area near where a Maryland woman went missing in August, officials in the prosecutor's office said. The search in the Seroe Colorado area was originally reported to have begun Tuesday, but the six dogs involved were being acclimated to the terrain then and the official search is scheduled for Wednesday through Friday, officials said. The search dogs and handlers being used in the effort are from the Netherlands, authorities said. The search begins early in the morning. The teams take a break from the midday heat and then go back out for a few hours in the afternoon. There are several groups active with search and rescue dogs in the Netherlands. Most of them train for missing persons and disaster work but also some do tracking and water work. The use of rescue dogs has become more widespread lately but the authorities are in general quite slow in requesting the help of dog teams. Most of the times it is more then 24 hours after a person is missed that the dog teams are called. Since the Rescue dog teams are all volunteer organizations there is no cost for the requesting party. (CBS/AP) ORANJESTAD, Aruba - A team of cadaver dogs searched through cactus and scrub brush Tuesday for the remains of Robyn Gardner, a Maryland woman who was reported missing by traveling companion Gary Giordano during a trip to Aruba. They planned to focus their search in a southeastern section of the island known as Seroe Colorado, not far from where 35-year-old Robyn Gardner of Frederick, Md., was reported missing on Aug. 2 by Giordano. What happened to the team with tracking dogs from the KLPD that Taco Stein was upholding well over a month ago? Page created in 6.237 seconds with 20 queries.